A unique tour where you can enjoy not only snorkeling and relaxing on the beach but you also have a chance to see rare pink dolphins in the waters near Khanom! 08:00 - 12:00. Minimum 4 persons are required. Longtail boat tour departs from Donsak pier. Transfer to the pier in Nathon, Koh Samui and Ferry tickets to Donsak are not included if you choose this option. While being on Koh Samui, you have a unique chance to see an extremely rare type of dolphins – pink dolphins. Their habitat is the Gulf of Thailand near Khanom. Only 30 minutes by speedboat and you surely will be lucky to see these fascinating creatures splashing in the water. After spotting the dolphins you will have a lunch and have to relax on the beach. After lunch, you will sail by speedboat to Koh Tan for snorkeling, or if you prefer, just relax on the beach. Then you will be taken back to Koh Samui and transferred to your hotel. 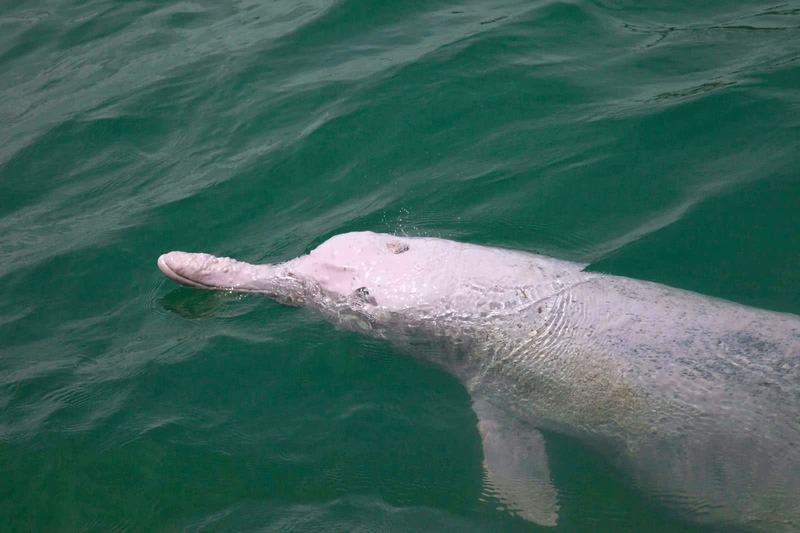 The pink dolphins found in the waters around Koh Samui is a subspecies of the Indo-Pacific Humpback Dolphin (Sousa Chinensis). Adults grow to a maximum of 2.8 meters and weigh up to 280 kgs. Coloration varies from brown-grey, pale grey or pink-white on their upper sides and lighter underside with grey speckles. Newborn dolphins ( about 1 meter long ) are normally grey changing to white or pink with grey spots as a juvenile (2 meters long) and white or pink as adults (2.8 meters long). Traveling in groups of 3-7 they prefer shallow coastal waters and feed on shoaling fish. They take their color from the presence of blood vessels near the skin which are used to control their body temperature. These dolphins are endangered mainly because of water pollution and entanglement in fishing nets. Reviews for "Pink Dolphins tour"
I think we saw about 20 dolphins? Grey and pink ones. Two close encounters near the boat. Amazing! After that we went snorkeling at Koh Tan which was nice. Perfect setting for a tasty lunch. Thumbs up for our guide too. He explained everything more than once and took care of every one. Never short of water or softs on the boat. Smooth ride on the speed boat. Gentle approach when in dolphin area. Definitely worth it and glad to hear that the number of dolphins is increasing..